I promised more of Merrilyn and Blossom and here you are. The two girls, possibly related as both came from the same area, seemed drawn to each other from the beginning. Merrilyn had been raised with Buster and Bob, but had always been an independent miss and the boys were far more often seen together and Merrilyn out on her own. She was also feisty with any kangaroo who invaded her space, but not so with Blossom. In fact Merrilyn took to being Blossom's guardian. Though she was no longer relying on a bottle from me and was free to move away, we saw her even more and when Blossom was outside you could guarantee Merrilyn would be there too. The weeks went by and nothing changed and this is one of my favourite photos and one of Merrilyn's favourite places to be. It was as if she felt Blossom was her own joey, though she was not yet old enough to be a Mom herself. Even when Blossom was old enough to be venturing out on her own, Merrilyn was always there in the back ground. Mind you she didn't keep her out of trouble. One day Blossom somehow managed to get her back toe caught in a crack in the concrete. She simply wrenched it out - leaving the nail behind and you may wish to skip the next shot, which shows you the damage. You can see the nail on the other foot so you know what she has pulled off. Kangaroos rarely make any sounds, but I was alerted to the problem by a lot of hissing. Poor Blossom. She was hopping and hissing. She was learning to be out of the pouch for longer periods so her pouch was not nearby. I grabbed it and held it open and in she hopped and with the weight off it the hissing stopped. I talked with the vet on the phone and we agreed that it should be kept clean and dry and nature would sort it out, and it did. 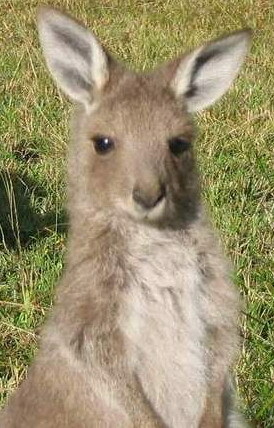 Though I was often at the vet, it is an incredibly traumatic thing for a joey to be taken to a vet and can cause more problems than it fixes, so anything that could be fixed here was fixed here. The toe healed and Blossom grew more gorgeous as each day went by. Here she is at 4kg and in the middle of winter - hence the fluffiness of her coat. Finally a note for those who have been searching for my Macropod (Kangaroo and Wallaby) Care Manual. Apologies as it did disappear for a while, but here the link to it if you need to down load it. Macropology. Until next time. Good to have you back with more fun posts! I love the pic with Merrilyn under Blossom's pouch..tugs at the heart strings...I can see why you get attached. That's also why I would never be good at doing what you do. I'd want to keep them all! I can see why that image of Merrilyn under Blossom's pouch is so special to you...it is such a special moment to have caught on film. My respect for the work you do increases with every post I read.Blossom is about as cute as any living creature could be. Your stories are such amazing illustrations of the fragile balance between life and death and in our relationship with all things wild. It is a real pleasure to read about your adventures with Merrilyn. I just can see every step of her development and she grows up in front of me!